A yearly pass to Butchart Gardens allows me to visit as often as I like. Miss A's mother used to work here and has a lifetime pass, so Miss A knows the gardens quite well. It's beautiful at every season. I thought you might like to see some of the larger vistas. Ethereal clouds of pink blossoms feature in almost every view. Here the pink is juxtaposed with the bright first willow leaves. The loveliness of the clouds of blossom made my heart ache. When Miss A and I discussed how beautiful everything she was, she began singing as we walked. "The trees are so beautiful - I love the camellias - Thank you, God for the flowers - The world is a beautiful place - How pretty is the grass" and so on. I walked silently beside her as she sang without stopping for at least 5 minutes. Utterly charming, lacking any self-consciousness. Magical. A thousand shades of green offer a perfect foil to the blossoms. Soon that white birch tree will be filled with leaves, but now it stands out as a pale silhouette. Flowering red currant is so pretty against the water. I think that's what this is, although I don't usually see it hanging downwards. Miss A and I watched the water fountain swaying back and forth for awhile and then she began dancing, following the rhythm of the water. She pointed her toes, extended her arms, crossed her feet. More magic. All that singing and dancing and walking was followed by a chocolate cookie and a drink of water in the coffee shop, then home to make Christmas trees out of play dough. The mind of a 4-year-old is a wonderful thing! Tell me, is spring starting to appear out your way? I hope so. I thought of my readers in the eastern part of the continent as I admired all these lovely blooms. Soon. Spring. Love the energy, enthusiasm and spontaneity that your charming Miss A is showing ! How lucky are you to be able to visit these lovely gardens regularly ! Spring is coming slowly here. The blossoms are just showing and there are going to be some magnificent Magnolias out soon. Lots of daffodils and the usual Spring bulbs. I think the japanese have a word for it? Beautiful is all I can say. It is so nice to see the gardens other than the time of year we visited. I envy your ability to visit here often and feel free to share photos as the gardens evolve. 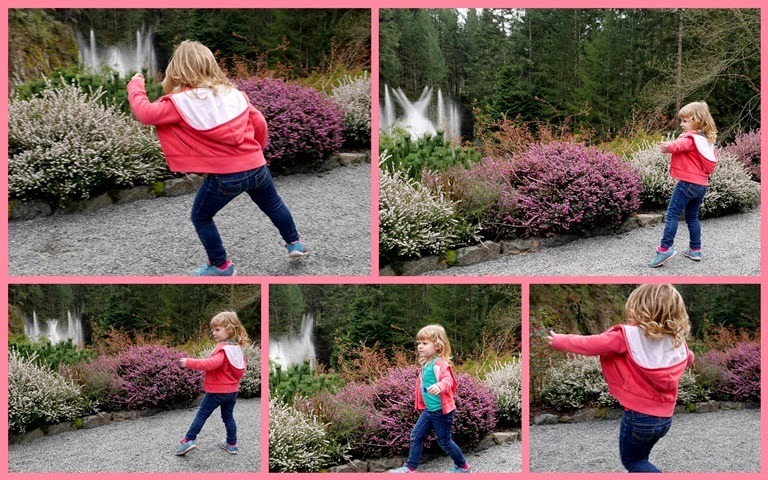 Dancing to the rhythm of the water fountain could be fun for any age! What a place, Lorri! Amazing! Little Miss A. sure seems to be enjoying it. Magical indeed! And what a cutie pie that little Miss A is... I just love her joy and freedom. Lessons from the mouth of babes. Gorgeous photos and thank you for letting us join you in your walk to that most beautiful garden. I totally understand about that ache you feel with all that beauty around you. PS. Spring is here but nothing stirring as far as blossoms. The snow is mostly gone but the ground is still frozen. Soon little green shoots will be coming. It surprises me every Spring how quickly it turns around and suddenly it IS Spring for real. I can't believe sweet Miss A is already four - where have those years gone? What a delight to take a child to Butchart. I know when I've visited (twice which still isn't enough) I've felt somewhat child-like myself. All the beauty surrounding one as you walk through is magical - and now I know some day I must get back in Spring to see it like this - I've only been in Summer. The trees remind me of ballerinas - and I love the stunning handcrafted fence in the second pic. Lorrie, we are getting blossoms this week - it was 82F on Tuesday - but has cooled again and rain later today. Typical early Spring for here - but hopefully no more snow such as our blog friends are having in the northeast US and Eastern Canada - phew! they've had far too much and I really feel for them still digging out in many areas. Enjoy these days - did you dance with the fountains too? P.S. Christmas trees in March? Oh well, when one is artistic anything goes - and at least she'll have them ready for December! Stunning views of Butchart's amazing gardens how lucky you are to have them close by. Little Miss A is growing up fast, loved the mosaic of her dancing. Beautiful captures and I really love the dancing to the fountain! What an enchanting day - I love it when children get lost in nature. The pictures are outstanding. Thank you for sharing spring with me...I see very few signs of it here. Such a beautiful garden you visited How lovely the pink blossom trees look, like Mary they remind me of ballerinas dancing between the other trees. My favourite season is Spring I love to see the blossom on the trees . I wish I could have been there to see Miss A's fountain dance. These girls never cease to amaze! And I like your photos of the larger vista, especially the first with the willow tree and the water. What a charming, absolutely delightful post. Sweet simple joys, priceless! Thank you for this glimpse of your granddaughter's charming personality. Such a special moment in time for you. Sometimes it is so much nicer to just listen and enjoy the moment. Nothing could be nicer than Springtime in Victoria! If only we could all be more like a 4 year old totally caught up in the beauty before her...lovely post! Such a sweet post Lorrie. The joy of the exquisite spring blossoms has the same effect on me too. And the happy dancing of a cute four year old is just adorable...... I love how small children respond to things around them with movement and singing so unselfconsciously too...delightful! Oh, such a pretty spot, Lorrie! My late beloved hubby and I visited Butchart Gardens on a stop when we were on an Alaska cruise. It was so lovely, but it was at dusk, and we never got the full effect. I'd love to go back one day. What a beautiful post! And the little one singing and dancing! What a great example for us all! What a beautiful place Butchart gardens is. Lovely photo's of miss A.! Have a good weekend Lorrie! How delightful is Miss A?! What a fun afternoon you had together! Sigh~ Lovely, so very lovely. Thank you for taking us along on your visit, Lorrie. Your photos are so pretty and the thoughts of little Miss A singing along is so sweet. Perhaps she, too, will work there one day. Happy Spring to you. We are seeing signs here in the form of daffodils, hyacinths, forsythia and some trees in bloom. Also enjoying the early morning birdsong. Oh dear Lorrie I just wanted to tell you how much I have enjoyed your recent posts. The photography has been pure bliss and your lovely thoughts are always inspiring. Have a wonderful weekend! Oh how lovely. Thank you for sharing these gorgeous photos and Miss A's little song and dance. What a blessing!! This post blessed me. Thank you. Gorgeous garden. Love the yes, red currant, and all the wispy pink.